This is the fourth installment in an ongoing Q&A series with Arts and Letters graduate students. Read more Q&As with graduate students and faculty members here. Paige Ambord, a Ph.D. student in sociology, received a bachelor’s degree in sociology from the College of Wooster. Before coming to Notre Dame, she spent a year teaching at Necmettin Erbakan Üniversitesi in Konya, Turkey, on a Fulbright grant. Her research interests include social movements and activism, urban sociology, and the sociology of culture. 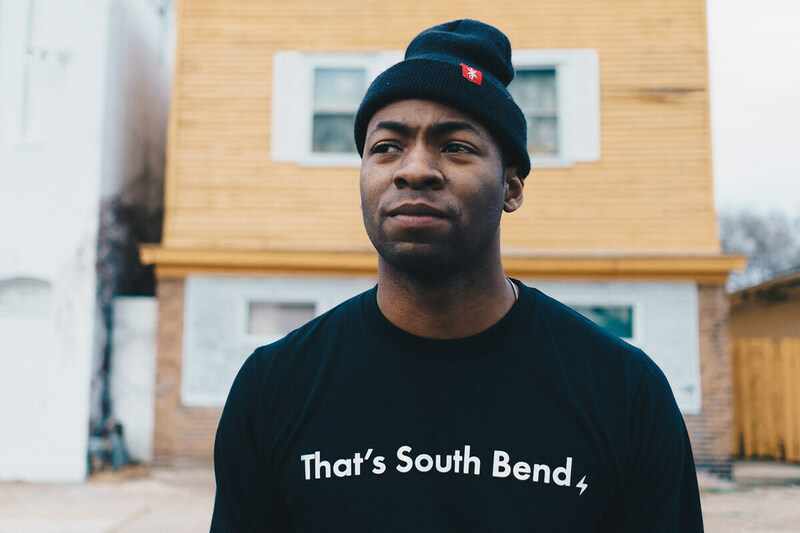 My current research looks at how local artists are using social media to rebrand the city of South Bend. Most previous work on the topic of place branding assumes that perceptions of a place are either created by professionals like PR firms or else made by individuals in their own minds, but I am interested in the ways that informal groups try to actively change how a place is perceived. In this case, these artists have to balance their goals with those of the city, as well as their individual goals with those of the group. In South Bend, changing the perceptions of the city also means navigating the city’s history, especially in terms of de-industrialization, the collapse of Studebaker, and the abandoned or underutilized spaces that remain from that period. I have long been interested in studying activism and civic engagement, but living in South Bend has led me to think more about the legacy of de-industrialization for cities and the ways that average people contribute to the process of urban revitalization. Honestly, I stumbled upon my current research project just by getting a bit more involved in the community and attending events featuring local artists. But I think that living in South Bend has made it clear that the city is changing, and importantly, that change is attributable not just to government, but to individuals and groups attempting to change their own city. 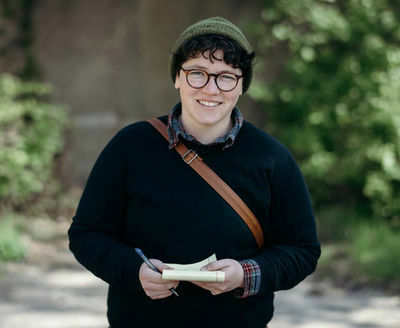 One of the artists Ambord studies, Jacob Titus, has created a website featuring his photographs of South Bend neighborhoods and landmarks, including this photo of a friend on South Bend’s Linden Avenue. I hope this research will help highlight the role of average citizens in how their cities are understood. Previous research indicates that the majority of activism occurs at the local level and is aimed at local issues, so it is important to understand how that activism occurs. I also think this work has the potential to reach those outside of academia. I hope this research will encourage people to think about change in their own communities, and so, I will be teaching a community engagement class next spring on this topic that will give students the opportunity to think about social change in South Bend, as well as their home communities. This research touches on two topics that are particularly important right now — urban redevelopment and community activism. Urban redevelopment and gentrification are occurring rapidly in communities across the United States. This research offers insights into how perceptions of communities are formed and changed, which are central to arguments over who belongs in certain spaces and whether cities are representing residents fairly. Likewise, we are seeing a surge in community activism, making it increasingly important to know how activism affects communities. Why did you decide to come to Notre Dame for your Ph.D.? I chose Notre Dame’s sociology program because it has so many top faculty working on topics I wanted to pursue. Not only are there multiple faculty doing work on social movements, but the department also houses the Center for the Study of Social Movements. The center brings together students for a weekly workshop and organizes the Young Scholars in Social Movements Conference each spring, which brings rising stars to Notre Dame. While that is a specific example, I think the department has faculty that are varied enough to support students with diverse interests. We are lucky to have faculty employing almost the full spectrum of methodologies and who are focused on a variety of subareas of our discipline. I also was drawn to the sociology department because of its cooperative atmosphere. I had felt that other programs were often highly competitive, with graduate students having strained relationships with each other and faculty, but at Notre Dame, the culture is organized around mutual feedback and cooperation in research. So, graduate students often work together on papers and support each other personally and professionally. This spirit of cooperation also extends to faculty. The Notre Dame sociology department takes seriously its commitment to mentorship and enables students to work with multiple faculty over the course of their graduate career. This means that students are able to get feedback from many different sources and collaborate with multiple professors on their research as well. The University also makes support for graduate students readily available — whether it’s institutional grants or access to data professionals. Originally published by Carrie Gates at al.nd.edu on March 28, 2018.